9. Monster Cable MP HTS2500 Ref. The Belkin SurgeMaster is great for the price.The price much better than what you will find at the store. *** Faster response time is more critical than number of joules. *** All you want is for your unit to be disconnected from the harmful surge. Therefore don't waste your money in over-extending your coverage of Joules.The Belkin SurgeMaster will provide adequate coverage with similar technology. Now...as an alternative...I have owned the Power Sentry's Power Blocker II (asin b0006hvigc) for a year and it has a faster response time.I am using that for my entertainment center which has more sensitive and large dollar equipment which I need to protect (don't waste your money on Monster products). The amount of transient (lightning) joules the Power Blocker II can absorb is about 900 joules. This number does not take into account the amount of joules that the Power Blocker II (PB2) switch is eliminating. The response time of the MOV components (the 900 joules part) is < 1 nanosecond. The response time of the PB2 switch is about 2 milliseconds. The way the Power Blocker II works is that the MOVs will clamp first and if the surge is of long duration, > 2 milliseconds, the PB2 switch will open and disconnect all possible electrical output paths. The way other surge protectors work is that the MOVs will clamp, and if the surge is of long duration, the MOVs will heat up and burnout a thermal sensitive fuse placed beside the MOVs. The heating and burnout time of the fuse is > 2 seconds, typically about 10-30 seconds. Other surge protectors attempt to absorb all of the surge energy entering the protector even though it may be excessive and cause MOV degradation. The Power Blocker II detects when surge energy reaches a damaging level and disconnects all MOVs and equipment connections, thus interrupting the surge. Therefore its MOVs are much less likely to suffer degradation or "wear out". Because of this rapid disconnecting feature, which blocks any further surge energy, in effect the joules of energy attempting to enter the unit and equipment are unlimited because everything has been disconnected. The MOVs are not degraded when the unit trips as described. 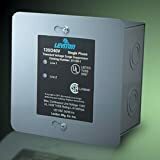 Therefore the Power Blocker II should operate much longer than conventional surge protectors and will survive power company mistakes and wiring faults when others surge protectors will nearly always be destroyed. So far we have not received any Power Blocker II returns with a MOV failure. Great choice for most Home Theater applications. And the best price on the market. I had almost given up on my TV after replacing/upgrading all my cables I still had a lot of interference and less than ideal picture. The only thing remaining to replace was a Proxima surge suppresor. I was amazed after I hooked up this Belkin Maximum unit. Not only did it completely fix the problem with the DSS/DVD/VCR signal, it also eliminated the contstant "hum" from my amplifier, and the audio is much sharper and cleaner. With EMI/RFI noise suppression up to 70db, I/O for coax cable/Satellite and phone line with 9 plugs, 3 spaced to accomodate brick type AC adapters, this SurgeMaster unit is an essential piece of gear for Home Theater setups with up to 36" TVs. Belkin even provides 6' phone and heavy duty coax patch cables to complete the job. Forget Monster, there is no way their surge protectors outperform Belkin's product line at double and triple the price. Buy this unit before you even consider upgrading your equipment/cables. I wish I had, but I now have a nice collection of cables laying on my living room floor to remind me that sometimes the best solution is the simplest. BTW, I paid $40 for this unit at a local retailer. $20 is a steal. This could have saved me a lot of time. About a year ago I got one of these to allow me to play DVDs for my kids on my laptop while travelling.It has an alarm that sounds when your battery is getting too low -- well it sounded immediately .I figured that my car battery was not fully charged or on its last legs.I hadn't tried to use it since.Now that I'm taking another trip, I thought I'd try it out in other cars.No luck.The thing is dead -- doesn't do a thing when I plug it in. I use this with a Dell Inspiron 8600.It works fine even when the laptop is being used and charging at the same time.I haven't observed the heating problems others have -- it gets only moderately warm. Bought one several years ago for camping trips.Use it in a Dodge Caravan with a laptop and with gameboys.It takes a beating by 2 boys in the family car.Has always been reliable and worked just fine. This unit failed to provide reliable power to my new Toshiba Satellite A60 laptop. It cycled on and off every 3 seconds. It powered a 100 watt lamp okay, but wouldn't start a 250 watt heat lamp at all. Product spec sheet says it can supply 400 watt surge and 200 watts for 2 min., and is rated at 140 watts continuous. 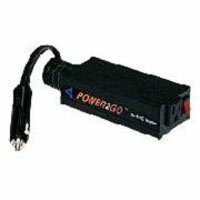 My laptop power supply is rated at 2A input at 100-240 VAC, and if it drew 2A constantly I agree that it would need 200 to 230 watts, which exceeds the continuous rating of this inverter. However, even at that power demand the inverter should run it for 1-2 min., but only manages 3 sec.In addition, I doubt that the laptop power supply actually draws a full 2.0 amps continuously. I talked to Linksys support, and they suggested returning the unit for replacement or refund, so I did. It did not work for me. Maybe it would work for a laptop that only needs 100 watts, but I wouldn't recommend it for more than that. Monster Clean PowerTM Stage 2 v.2.0 circuitry filter dramatically reduces electronic noise. I just got a Panasonic Plasma ED TV and was concerned to get a good surge protector that might also enhance the picture quality. Before getting the Monster HTS 1000 I noticed some annoying picture glitches occasionally cropping up (I get a directv standard digital signal): a kind of vague line that, especially when background colors were pretty homogenous, you could follow moving up the screen; the kind of thing you could easily overlook but once you notice it, you can't help seeing it and it drives you crazy. Since running everything going into the tv through the Monster 1000, it's completely disappeared. So, this thing really does seem to deliver on what it promises: a cleaner picture. First, I can't comment on the HDTV and Satellite issues mentioned by other reviewers so I would check that out before buying.But with that being said this was a great purchase for me.And I highly recommend it. 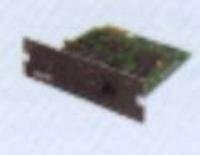 A few months ago I borrowed the S-video connector for the Xbox so I could see what the quality would look like.Of course the S-video on the Xbox rendered an image that was at least 50% better quality than the composite.That is what I would expect.I gave it back and resolved to get one later. Last week I got the HTS-1000 and hooked up all my equipment.When I fired up the Xbox (hooked up via composite) the picture quality was about the same as it was when I hooked up the S-video.Even my wife, who thinks I am what too critical about such things, noticed the difference.She told me that she didn't expect to see a difference.She doesn't notice subtle quality in audio and video, but was surprised that she saw such a marked difference. The cable TV is clearer, the DVD has more vivid colors...some of the improvement is hard to describe other than just saying the picture is soooo much better. I will say this though, my home is small.The kitchen, with its high power drawing appliances, is close to the living room.All these appliances contribute to the dirty power.You could see less improvement if your home is laid out differently or have newer appliances. I didn't give it 5 stars because it is bulky.It has plenty of room for power bricks, but it has a high profile.The strip that Monster sells that has a slim profile doesn't have room for bricks.Also, the schema for what devices are switched and what aren't doesn't make sense to me, but it is nice to have 4 outlets that are constant power. Summary:If you have lines, ghosts, poor color, whatever...try this out it could make a world of difference. This unit did not work at all with my Direct TV receiver. I have a new Direct TV HD-Tivo DVR-250. It's an all in one unit. After hooking it up correctly, I could not receive any satellite signal. Removed this surge protector and everything went back to normal. I don't think it supports everything. Better check before you buy. I bought this unit to protect my new 51" HDTV and as soon as I plugged the coax video RG-6 cable into the unit to protect my link from the cable provider to the set-top box I lost 1/2 of my HD channels.I called Monster tech support and was told that the unit did not pass all the high frequency signals needed for HDTV.He did say they they would ship me out a Monster HT200 which would pass the HD signals. But it never arrived.After waiting two weeks I email their tech support and got a call where Eric V said he would mail me out a HT200.In all I would stay away from this product if you are trying to protect your HDTV until they modify the product. Monster Clean Power Stage 1 v2.0 filter to provide noise-free power to your sensitive electronic components. 8 ft. Monster AC power cable with FlatProfile right angle plug provides flexibility for installations. I'm an audio guy first, so I can tell you first hand, yes, this has improved the imaging and dynamics of my system.For video applications, colors are more vivid, pictures sharper, and even cable TV looks better. This is [money] well spent.Give it a week to break in, and you'll really start to notice how much you're enjoying music and watching movies, with this hooked into yer system. ...at least somebody is catering to this market. There are so many products out there (cables, power, etc.) that are so obviously designed to make money by giving you the cheapest possible components.I purchase my Monster products with delight because at least they APPEAR to care about quality. I have never actually compared this power strip to another by watching the same video feed and cannot say for sure that it does what it says with regard to filtering AC pollution. BUT, I do know that AC pollution exists and sometimes my mobile video equipment will pick up radio signals and corrupt microphone recordings. This power strip does completely eliminate RF (radio frequency) interference, and that alone made it worth the purchase for me. A Home Theatre Must !!!! An Entertainment Center Joy !!!!! 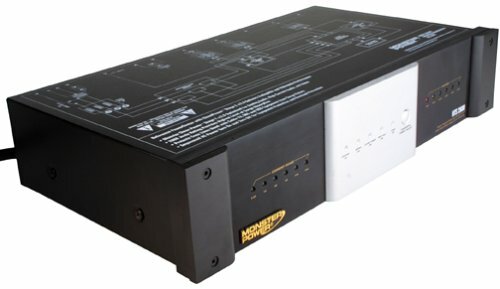 The "Monster CLEAN POWER circuitry (Model HTS800) has it all for your audio / video components.Including Sound & Picture. Simple to use Monster provides you with color coded outlets with mathching tags to apply to the appropiate plugs. (This is very important in those times of removing the correct plug without disturbing the existing system setup). * The power cord is 8 foot in length and has a 3 prong plug with a 30 degree offset to allow use of adjacent wall outlets. (A very convenient and wonderful feature). 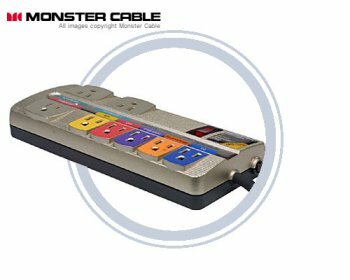 * 8 outlets to cover all your needs, 5 color coded ones to include; VCR, DVD, Cable, CD, & Audio AMP.3 additional widely spaced outlets for TV and 2 Spares. * Video cable antenna (coaxiale)/ DSS or DIVX surge protection filter circuit (improves cable picture by up to 30%). * Phone line surge protection filter. * A free 6 foot monster video and telephone cable. *Visual and audio surge alarm. This CLEAN POWER system is a must for that Family Room with all the gadgets !!!!!!! Your investment needs to be protected and this is the ALL IN ONE product that can do it for you.I love mine. I have a 36 inch Sony Wega TV, Pioneer DVC302D DVD player, SONY VCR and a code less phone on the Monster Cable MP HTS800 HP Surge Protector. Observed a slight improvement in picture quality after installing the HTS800. Really liked the color-coded AC outlets with matching labels. Also theextra space between power outlets so that power adapters for telephone etccan be connected easily. I recommend this product for your home theater. 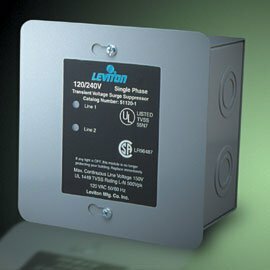 12 AC outlets for AC surge protection. A silver bullet for interference issues? I'll start by saying I am NOT a Monster Cable fan.I think for the most part they sell overpriced cables and interconnects to unsuspecting consumers and laugh all the way to the bank. However, in this case, I had just bought a new HD TV, and found that I could now see substantial interference on analog cable channels, as well as minor interference from any input. After consulting several experts, I was told that I could have 1 of 3 things going on, and most likely a combination of at least 2 of them... 1.) Cable line ground-loop interference 2.) Power line ground-loop interference 3.) General RF interference. Looking around at different power conditioners and cable-line isolators brought my to this Monster Cable product.I purchased it keeping in mind Amazon's excellent customer service on returns. I was more than ready to be skeptical. I hooked everything up, ran the cable line through it, and powered on.The difference in the video interference problem was pretty profound.I'd say there was a 95% improvement, and I can only see the interference now if I'm looking for it. Supposedly this product was really designed to help my audio system (and the video cleaning was an addition), but I have not had time to give my setup an in-depth listen since installing the PowerCenter.To be fair, I've never had a complaint about my audio, as "crackles" and interferences occur very, very rarely. 24k gold-plated grounded plug for maximum conductivity. Monster Clean Power Stage 2 v2.0 application-specific filters for enhanced A/V performance. $250,000 guaranteed connected equipment protection and product warranty. 2775 joule rating provides highest level of surge absorption. Monster Clean Power Stage 4 v2.0 application-specific filters. All outlets are fully programmable to be switched, switched with delay, or unswitched. Ultra-high 2775 joule rating provides highest level of surge protection. Sequenced AC power turn-on and turnoff for equipment protection and overload prevention. I have a Sony Grand WEGA KF42WE610 42" using Comcast Cable reception w/o the box (analog reception).I wanted to give a bare bone truth if the HTS5000 is any good or not.After spending 1hr 30minutes properly installing my plugs, making sure my wall socket had 3 prongs (not use a 3 prong to 2 prong cheat which will void your warranty, the HTS5000 will not register as being grounded) and installing some copper wire to grounding the HTS 5000 itself (water pipe, iron/steel fixture tucked behind a wall or heater vent will do nicely) I was finally able to plug the HTS 5000, turn on the Sony STR-DE885 receiver w/ 150 watt preamp sub.I immediately noticed a better quality of sound and I was finally able to maintain its volume (as it would decrease and I would have to turn it up even more).It is the same sound quality as mentioned earlier with the Best Buy receiver.The picture is less pixilated and flesh tones are better (although nothing like Direct TV).Cartoon network has vivid, sharp colors (the colors orange and yellow, blue and purple, etc are distinguished.#1 noticeable difference pronounced even as I write this review is the TV's sound quality!It is as good as my STR-885 Sony Receiver!The sound volume remains the same and the bass is much richer then before.The voices are crisp, clear and audible.In the past I accepted the fact that my TV speakers were no good (reason for buying the STR-885) until today!Another positive trait is viewing Channel 2 via cable.In my area channel 2 is the worst channel, producing a series of thin horizontal to diagonal lines. The lines are very noticeable and distractinggiving a3d effect as you attempt to watch a program only having a 75% viewable screen.After installing the HTS 5000, channel 2 is now 95% viewable.You now have to look real hard to find them from 5' away! This is 2nd biggest improvement as I already have a 4 port, Electroline Drop Amp with single shielded RG-6 cable wire. The coax cable is connected to the HTS 5000 and a Monster top grade coax cable from the HTS 5000 to the TV. Although double shielded RG-6 coax cable would do better most that I have found do not have a solid copper core.As I was told that the signal travels around the circumference not inside.Regardless if you have solid copper core or not It is extremely important to check your cable connections to make sure the exposed copper wire does not have any marks or nicks around the circumference!If any are found there is a 100% chance you are not receiving the best picture possible.It is a MUST to cut the wire just below the connection,then buy $10-$18 "plastic" 2-Blade rotary coaxial cable stripper to properly strip it, place a coax connector then screw it back on your TV (This is intended for coax cable installed by your cable company.Monster coax cable and such are not part of this side note). When I first turn plugged this unit in Voltage was at 125V and did drop to about 115 volts using appliances in the kitchen.I did notice voltage as high as 125 volts until I turn the TV on then it would drop to 120 volts.I also have my computer, DSL and 18" monitor hooked up to the HTS 5000 and it remains 120 volts with the TV on!I did not notice anything better with the computer DSL or monitor. Tri-ModeTM circuitry with audible alarm and auto disconnectprovides the most comprehensive power protection. 270° analog voltmeter for instantaneous monitoring of power fluctuations. 3145 joule rating provides highest level of surge absorption. 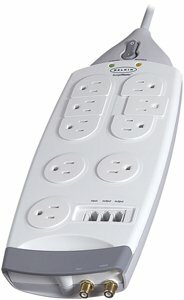 Programmable switched and un-switched outlets. This is a great value for a power cleaner/surge protector under $100. This will clean dirty electricity better than pieces in the hundreds of dollars in other brands, for a better picture and better sound. It also protects against cable spikes with it's coax protection. Not only are the color coded outlets nice to look at, they also help to correctly unplug the home theatre component you were looking for. Try and find something like this with an 1850 Joule rating, that has a lifetime replacement warranty. When your tv blows up from a lightning hit, don't say I didn't warn you. I bought 4 of these for all my tv's!! I recommend these to all! I own this powercenter. It's great and performs better than my "Tripp" IT HAS A PHONE JACK. I don't know why Target would publish a review from someone who obviously can't figure out which model he/she bought. Unfortunately for Monster ... they did. A happy Monster purchaser and convert who has experienced the "Monster Difference". Works great----Not sure if I'll ever need the surge protection...but it's nice knowing my gear is protected. The extra long, flexible power cord and color-coded outlets with labels are very convienent. Well worth the 50 bucks. I admit,this is a nice "looking" power strip and it will work just fine with your electronics equipment,but you can get the same quality in a surge power strip for half the price of this one.With Monster Cable products,it seems that 50% of the product's price is in the way it "looks",not what it actually "does". Power problems wreak havoc on todays multitasking networked or stand-alone PCs. The more you do with your PC, the more you stand to lose. An APC Back-UPS Pro instantly switches your computer to emergency battery backup power and allows you to work through brief power outages without data loss or downtime. 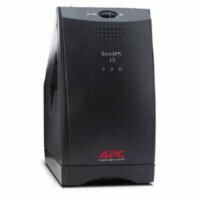 The APC Back-UPS Pro uses PowerChute&reg; plus power management software with WorkSafe&reg; to save files and shut down your computer safely in the event of an extended power failure. High-performance surge suppression for AC line and network/dataline protects all paths to your system from electrical noise and damaging power surges - even lightning. Had mine since December 1999 but noticed that the battery failed after about 3 years, like the other poster wrote, APC didn't list a replacement at first but now they do and I finally got around to replacing it.Battery type is RBC2 for those wondering. Solid unit, having a telephone line/out and USB controller is a plus. I have owned one of these UPS's for about 3 years.Earlier this year the alarms went off indicating that the battery needed replacement.I thought that was odd considering the age of the unit.No problem though,I'll just log onto APC's website and order a replacement battery.Wasn't I surprised to see that APC indicates that this model doesn't have a replacable battery.This didn't make much sense to me since the unit has an access door to the battery compartment. Well,I removed the battery and found a web vendor that had a replacement for $18.It is a very common 12volt cell and was available from several vendors.The unit is back up and working well again. 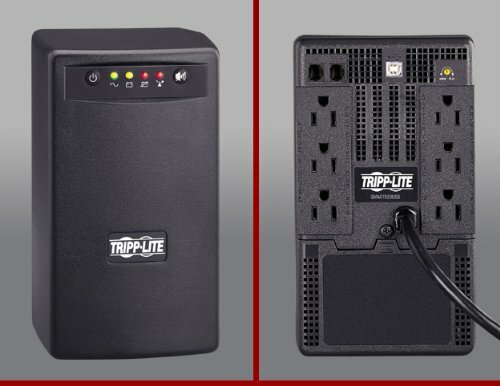 I have experienced several black-outs in the past few years and this UPS can keep my CPU, 19" monitor, cable modem & network switch operable for enough time to save any work in progress and shut down my system. In closing, it is a well designed unit with adequate power for most home or small office systems.But I was a little put off by the short life of the original battery and incorrect replacement information listed by APC. This unit is my 2ed UPS made by APC.I out grew the other and decided on this unit. The USB connection is what sold me on this as I leave my computer on most of the day.It did shut down (using the included software) during a test I ran and the software as gives you a battery charge state.A must have if you are in an area that has frequent power problems.With the built in surge protection, you can't go wrong.